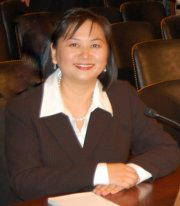 Judge Nguyen has served as a United States District Judge in the Central District of California in Los Angeles since 2009. Nguyen was born in Dalat, Vietnam, and in 1975, she fled the country as a girl along with her family as Saigon was in the process of falling during the latter stages of the Vietnam War. Her family was placed at a refugee camp in Camp Pendleton, California, where they lived in a tent city for over one month before settling in the Los Angeles area. Nguyen received her A.B. from Occidental College in 1987, and her J.D. from UCLA School of Law in 1991. She began her legal career at the law firm of Musick, Peeler & Garrett LLP, where she was a litigation associate from 1991 to 1994. In 1995, she joined the United States Attorney’s Office in the Central District of California, serving as an Assistant United States Attorney in the criminal division. There, she worked as a federal prosecutor in both the General Crimes and Public Corruption and Government Fraud sections, and was a member of the office’s Organized Crime Strike Force from 1999 to 2000. Nguyen served as Deputy Chief of the General Crimes section from 2000 to 2002. She was appointed to the state bench as Judge of the Superior Court of the County of Los Angeles in 2002 and remained a judge on that court until she was appointed to the federal bench in 2009.